Crawley Town captain Dannie Bulman admitted losing to Lincoln City gave him a bad taste in his mouth. He did not think there was much between the two sides until the visitors took their chances. 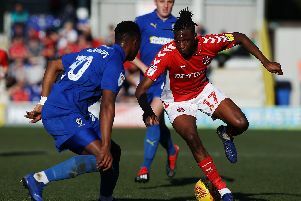 The Reds’ talisman revealed the team believed they could repeat the feat of when the two sides met before in September (when Crawley won 1-0 away) and get something from the game. He said: “After any defeat there’s always going to a bad mood, a bad feeling and a bad taste in your mouth. “But that’s football; we must pick ourselves up and hopefully get three points next week against Morecambe. “Even up to the first goal there was nothing in it up until the 35th minute. “There was good movement from the striker, he (Bruno Andrade) got across the defender and nicked it in. “That was a kick in the teeth and I thought we reacted well but they were ruthless and we weren’t. 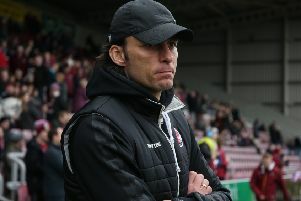 Bulman reckoned Lincoln City were reminiscent of promotion-chasing Reds under the management of Steve Evans. He said: “It reminded me of the Crawley of old under Steve Evans; not great on the eye but we were hustling and bustling and very functional. “We played to our strengths then and you’d put your money on them going up.